Go beneath the surface to Rome’s Christian Catacombs on a 3-hour, private tour, and choose the burial site that interests you most. 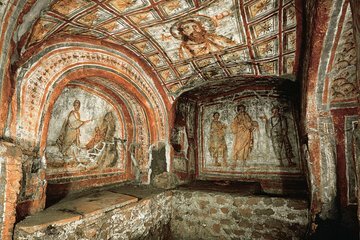 Step back into early Christian history at the sprawling catacombs of St. Domitilla, and see a 2nd-century fresco of the Last Supper. Explore the remains of the catacombs of St. Sebastian, where ruined sarcophagi and ancient arches are all that remain of the cemetery. Visit the catacombs of San Callixtus to see the burial sites of martyrs and pontiffs, and return to your hotel via the Appian Way. Great guide! As usual she went the extra mile to make it spevial for our grand kids!